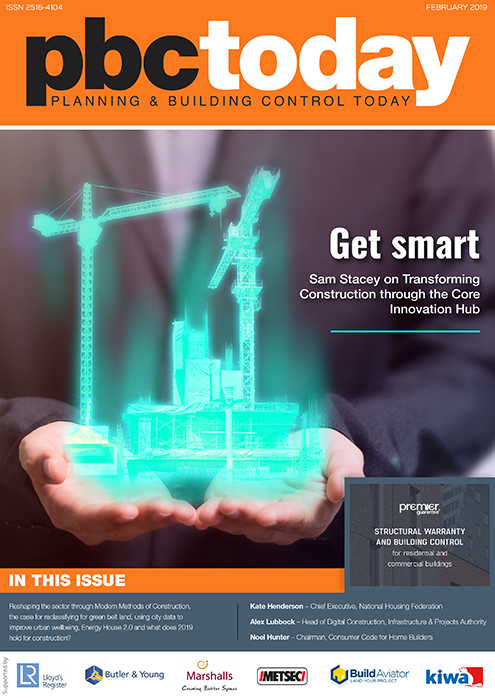 In the PBC Today February 2019 edition, Sam Stacey, challenge director for Transforming Construction at UK Research & Innovation, discusses the new, government-backed Core Innovation Hub, which aims to support the development of technologies that will deliver a “new kind of construction”. Meanwhile, Kate Henderson, the new chief executive of the National Housing Federation, examines how we can deliver not only more homes but the right homes, in the right places – and at the right price – to create sustainable communities. Elsewhere, Ben Channon, senior architect at Assael Architecture, discusses his book, Happy by Design: A Guide to Architecture and Mental Wellbeing, which argues that those who shape the built environment can and must do more to make people feel safer, happier and more connected with their surroundings. There is much more besides, from an interview with Noel Hunter of the Consumer Code for Home Builders to a profile of the University of Salford’s world-first research centre, Energy House 2.0, and a look at the big issues facing the construction industry in 2019. The Construction Innovation Hub support collaboration across the digital, manufacturing and construction sectors to develop and commercialise technologies that will help transform the sector. Sam Stacey, challenge director for Transforming Construction at UKRI, outlines how it will work. Tackling the housing crisis is more than just a numbers game. Kate Henderson, new chief executive of the National Housing Federation, sets out the challenges we need to address to create truly sustainable communities. 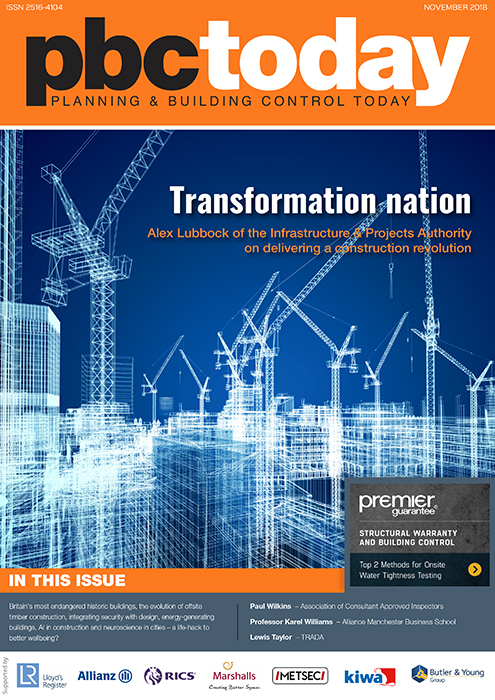 Alex Lubbock, head of digital construction at the Infrastructure & Projects Authority, discusses how Modern Methods of Construction can reshape the sector to deliver higher productivity, quality and performance. We must take the lead on designing for mental health, writes Ben Channon, senior architect at Assael Architecture and author of Happy by Design: A Guide to Architecture and Mental Wellbeing. Noel Hunter, chairman of the Consumer Code for Home Builders, talks to PBC Today about protecting buyers from nasty surprises when making one of the biggest purchases of their life. How can we use city data to create urban wellbeing? Tom Leaver of Future Cities Catapult takes a look. A £16m home energy research centre to test innovative construction, smart home and digital products has been given the go-ahead. PBC Today takes a look at Energy House 2.0. Richard Hyams of architectural practice astudio argues that redefining the green belt will help tackle the UK’s current housing crisis. The Welsh government’s rejection of proposals to only allow LABC building inspectors to oversee high-rise residential buildings recognises the important role Approved Inspectors play in this key area of building control, argues Paul Wilkins. 2018 saw some big changes and big challenges for the construction industry. Simon Lewis and Hannah Gardiner of law firm Womble Bond Dickinson look back at the key developments – and highlight what we can expect in the year ahead.